Working on your car today isn’t like it was when we helped dad and grandad out in the garage. Tuning an engine for performance or just optimal efficiency requires using an Onboard Diagnostic (OBD) scan tool, and a minimal amount of technical know-how. Sure, you still need to know which way to turn a screwdriver or spanner, but the amount of computer technology integrated into the functions of the average automobile has grown by leaps and bounds since OBD scanners were first introduced back in 1996. Whether you are a Kia or Hyundai driver looking to handle your own vehicle maintenance or you run a custom/performance shop that specializes in Korean-built cars, you will need a good OBD scan tool that works with your vehicle’s onboard computer. Check out my reviews and recommendation to find the one that’s right for your maintenance or performance tuning needs. The G-Scan 2 is the 800 lb. gorilla of the OBD II scan tool world. It’s got everything you’ll ever need and then some. Want wireless connectivity so you can walk around the car while running it on a dyno? This model can do it. Need access to global trouble codes? Good to go. Whether you work a shop or have a home garage of your own, this is the last word in scan tools. Integrated calculators for resistance, voltage, amperage, etc. The variety of connectors and features you can use on the G2 is similarly staggering. Add to that the ability to upgrade firmware and software via Wifi like a smartphone or tablet, and you’ve got a high quality diagnostic tool that keeps itself current on the latest vehicles and trouble codes all by itself. There’s nothing I’d rather have in my shop than a G2. Okay, so as awesome as this scanner tool is, I do have a few caveats. First, it’s a little on the bulky side. That does make it much more durable and resistant to shocks and drops, but it’s also fairly heavy to lug around the shop compared to an ordinary tablet. Additionally, while the multiple connector kit is included if you get the complete pro package, buying it separately adds significant costs. It makes an already prohibitively expensive device even more expensive. I also wish it came with a Bluetooth dongle connector so I’d be more free to move around the shop or to use the scanner tool with a car on a dynamometer. As much as they do include in the pro kit, you still have to buy the Bluetooth dongle separately. I picked this one because it has a smaller footprint and weighs less than similar models. It’s also in a lower price point thanks to running Android OS, and it’s a better fit for home mechanics and tuning fanatics compared to other models on this list. This compact and efficient machine is a joy to use around the shop. It feels great in the hand, and can stand to plenty of drops and shocks without any issues. I also prefer the Android OS over Windows CE in terms of ease of use and software stability. When you are working around the shop, there are few things more annoying than a constantly rebooting scanner tool. The WiFi connectivity also makes it easy to keep your database up to date, and you can set the device to handle all updates automatically, too. My favorite feature by far though is the Auto Vin lookup capability. Punch in the VIN for any vehicle, and it will pull up that car’s OBD profile instantly. This can be a huge time saver, especially when you are working on a newer model car. Connectivity is my chief complaint with this particular scan tool. WiFi is all well and good, but this device doesn’t have Bluetooth for use with wireless connectivity accessories. If you want to use this device while your car is on a dynamometer, you better have a nice long cable. I’m also not a fan of the screen on this model: I’ve seen clearer and easier to read touchscreen controls on much less expensive models. Lastly, this device isn’t exactly slow, but I did notice a bit of a delay when connecting and reading the car data. It’s not a big deal, but when business is booming and you’ve got a backlog of cars to get to that day, the delay can be a little frustrating. Some of use don’t need as many bells and whistles on our scanner tool: we just want the basic features and functions so we can do our own automotive maintenance and repair. The iCarsoft i901 is the perfect solution for those who want a bare-bones scanner that provides them with the engine data and trouble code info they need without a bunch of features they may never use. I am including this in my product reviews as it’s great for home use, but power users like professional mechanics may find it falls short of expectations. It doesn’t get any simpler than this scanner, and that’s why I love it as a home garage scanner for use with Hyundai and Kia cars and SUVs. Plug it in, turn it on, and get a complete report with just a few quick taps of the buttons. While it may not offer the ability to program and tune onboard systems, the ability to find out what’s wrong with your engine and other systems in your vehicle is still a fantastic resource to have in your shop or at home. I would not recommend this for pro shop usage for a multitude of reasons. First, it can only work with Hyundai and Kia cars, so if you own or drive anything else this is not the scanner tool for you. Additionally, if you need to do more than reset codes and read diagnostic info, this device isn’t built for much more than those two functions. Last but not least, you don’t have the ability to reconfigure engine systems to suit your preferred specifications. Need a pocket sized scan tool that will work well with any model car? Launch has you covered with their Creader VII+ CRP. Not only does it work seamlessly with Hyundais and Kias, but it also works with just about any other major manufacturer in the world. I felt it was worth reviewing and including in this list since it allows you to pull and clear engine codes quickly and easily without the need for expensive and complicated connections. It’s any mechanics best friend next to their favorite socket set. I like a no-frills scanner tool I can carry around with me all day. Tablet style super-OBD II scan tools are cool and offer more features, but there’s a lot to be said for the convenience of the Creader VII+ and its small footprint. You also get much better value right out of the box compared to similarly price models. You can take it out, charge it up, and you’re ready to roll. No extra accessories to buy, nothing to pick up later you didn’t realize wasn’t included. Best of all, despite being push-button operated, the interface is simple and easy to read in any lighting. It’s not as flashy or capable as the big tablet models, but it’s definitely a step up from standard pocket scan tools. So, I have few complaints about this particular scanner, but there are a few things I’d change. First, Bluetooth can be installed in just about anything now, and the technology continues to get cheaper. I’d love this scan tool more if it could be connected to a Bluetooth OBD II dongle. Then I wouldn’t need to worry about the extension cable coming unplugged or getting caught in the doors. Additionally, the display is bright and easy to read, but it’s still pretty small, and my eyes don’t work like they used to. Something with a larger LCD would definitely be ideal for me. For home garage users, there isn’t a better product out there than the Innova 3160g. It is just as at home in a professional repair or custom shop as it is in your garage, and it offers a wider array of capabilities and features compared to most pocket size models. A full color display, Bluetooth connectivity, and an LED-illuminated OBD II plug are just a few of the convenient features that the 3160g offerW. It’s a great buy for pros and amateurs of every skill level, and makes tuning your engine just the way you want it a snap. There’s a lot to love about this scanner, and while it’s not as pocket sized as some it has a ton of features no mechanic wants to be without. It’s compatible with many makes and models as is, and you can get additional plug adapters if you need them. Live readings, live graphing, easy to read stats and metrics, and the ability to update it via Bluetooth using a Windows computer all make it an excellent choice for keeping in your home shop or your place of business. I also think the illuminated DIN connector for the OBD II port is a genius idea. Not a lot to dislike here, but I will say that having WiFi would be a nice future option, and a rechargeable battery pack would be nice to have as well. A fresh set of batteries lasts a while, but when you run out of batteries and the meter is dead it's a pain. 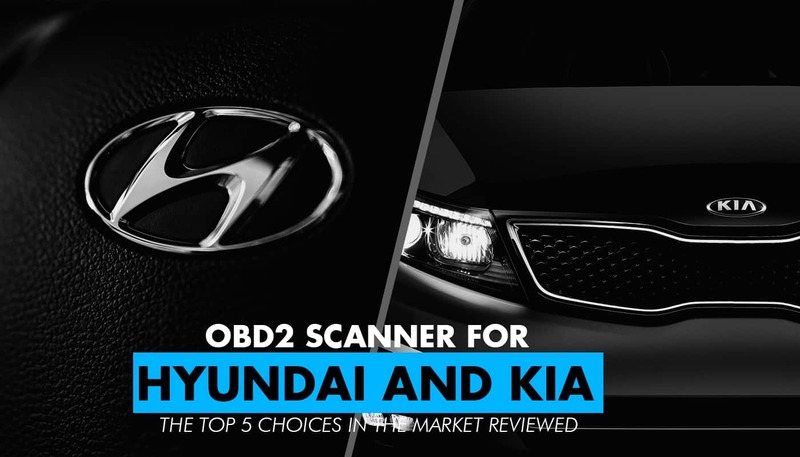 After extensive research and comparison, I’d say the top pick for best value versus cost is definitely the HYUNDAI G-Scan 2 Tool, with the iCarsoft i1901 as the best budget option. The G-Scan 2 comes with literally every type of connector and cable you will ever need, and it works with Hyundai, Kia, and every other imaginable make and model of car with an OBD or OBD II connector port. It’s pricey, but you never have to buy anything else ever again for your kit. The iCarsoft i1901 is perfect for amateur mechanics and tuning enthusiasts who want to diagnose what modifications or changes are doing to their performance, and for finding problems with components and replacing them. Both are great options regardless of whether you are shopping for professional or amateur grade scan tools. Check them out for yourself, and pick the one that works best for you.